I'd been putting off looking at this book as it seemed too "girly" to read to my son. (I know, I'm terrible.) But as with all the influences I used to deprive my son of, I've loosened up on keeping him away from all things pink. It's nice to know a book like this was around before princess madness took hold of the female under-seven set. This title is girly without being obnoxious and harkens back to a simpler time before girls needed castles and kingdoms and princes and crowns and thrones and wanted -- quite simply -- a pony. You fall in love with this girl and her horse. 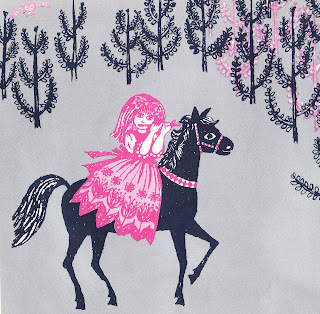 Her pink hair flowing behind as her horse sprouts butterfly wings and "disappears like mist rising from the mountaintops". It is all so dreamy and wonderful, until -- that is -- you realize it was only a dream, and the horse belongs to the girl only when night comes again. Sweet, sweet dream.